For anybody who is planning to buy a Xoom tomorrow, we finally have an idea on how the upgrade to 4G LTE compatibility will work. Instead of just being a simple software update, you'll have to send your device to Motorola, which, while free, will take "up to 6 business days." The process will be available approximately 90 days after the Xoom is released, and will remain available for six months. Be warned, however - this may result in some unpleasant circumstances, as users are warned to backup their device before shipping it. 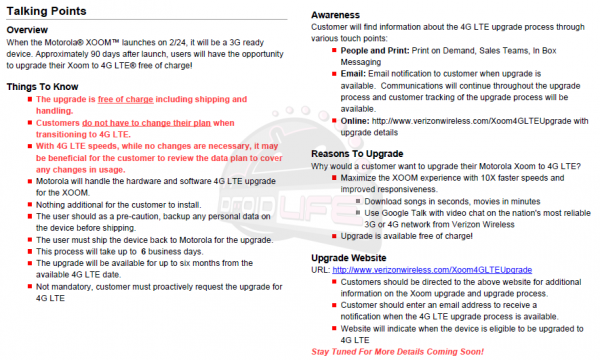 The details should be available officially tomorrow, and will be found on Verizon's soon to go live Xoom 4G LTE upgrade page.